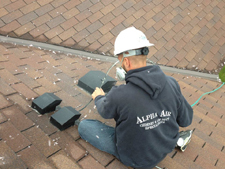 Alpha Air Corporation offers complete dryer vent cleaning services throughout the Minneapolis area. Dryer vent cleaning is not something that many people think about. However, clogged dryer vents cause over 15,000 house fires and millions of dollars in damage each year. With that kind of risk at stake, more homeowners in the Minneapolis area are starting to pay attention to the vents on their dryers. At Alpha Air Corporation, we’re committed to our customers’ comfort and safety, which is why we offer dryer vent cleaning services in Minneapolis. Most of us know to clean out the removable lint catcher in our dryers. This small filter is intended to catch lint before it gets exhausted out through the dryer’s exhaust vent to the outside. Obviously, not all of the lint gets caught in that trap. Over time, as lint and moisture get exhausted out through the dryer’s venting system, lint will start to build up. At first, it’s just a few pieces of lint here and there. But with more moisture and more lint, it can eventually start to form a very serious clog. Here are some of the negative effects of such a clog. Increased dryer time — In order to dry your clothes, your dryer needs to exhaust air and moisture. When the exhaust lines are clogged it will take longer to dry your clothing. Decreased efficiency — In order to push the air and moisture out, your dryer will have to work extra hard because of the clog. Increased equipment wear — With increased effort comes and increase in wear and tear on your dryer. How Does Dryer Lint Cause Fires? Lint is actually mentioned in the Boy Scout’s handbook as a very good fire starting material. As lint slowly builds up in your dryer vent it can eventually start to reach inside the unit. When that happens, it can come in contact with the heating element. From there, the fire continues to smolder and build. When you call Alpha Air Corporation for dryer vent cleaning services, we’ll send out one of our technicians as soon as possible. Here are some of the steps that they will take during the cleaning process. Inspect the venting system — This will include the outdoor vent or vent hood. 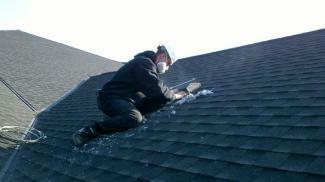 Our technician will look for blockages and bird or rodent nests. These can also lead to the build–up of dryer lint in your exhaust vents. Pull the dryer away from the wall — In order to access the venting system properly, the dryer must be pulled away from the wall and disconnected from the dryer exhaust line. The tools — Using a special brush, vacuum, and air tools, our technician will pull the lint out of your system and make sure that there isn’t any mold or mildew remaining afterwards. Reconnect — Our technician will then reconnect the dryer venting system or replace the vent line as needed. At Alpha Air Corporation, we want to leave your home cleaner than when we found it. We will make sure that the lint removal process doesn’t leave a mess. If your dryer venting system hasn’t been serviced, it might be a good idea to call Alpha Air Corporation today to schedule dryer vent cleaning services. One of our friendly, certified technicians will be able to talk with you about the options available to your home. Alpha Air Corporation provides dryer vent cleaning and other duct cleaning services to the surrounding Minneapolis area. Contact us today to speak with one of our specialists about dryer vent cleaning and schedule your next service appointment with us. The tech that came out was very professional, on-time and neat. He provided great answers for the questions that I had and I felt he completed everything that we asked was completed. Would definitely refer them in the future.